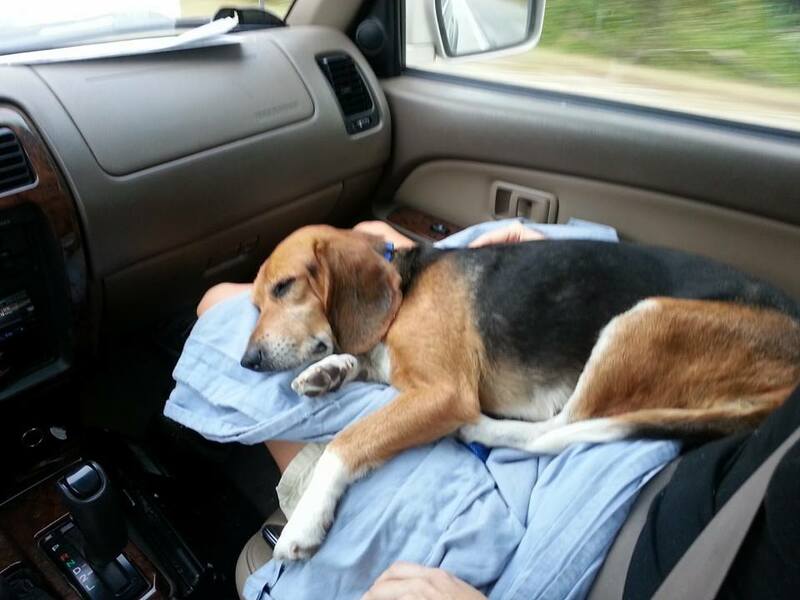 Suzanne was traveling for work when a volunteer named Amanda posted a plea for help in finding a home for a 6-8 year old Beagle named Amanda. 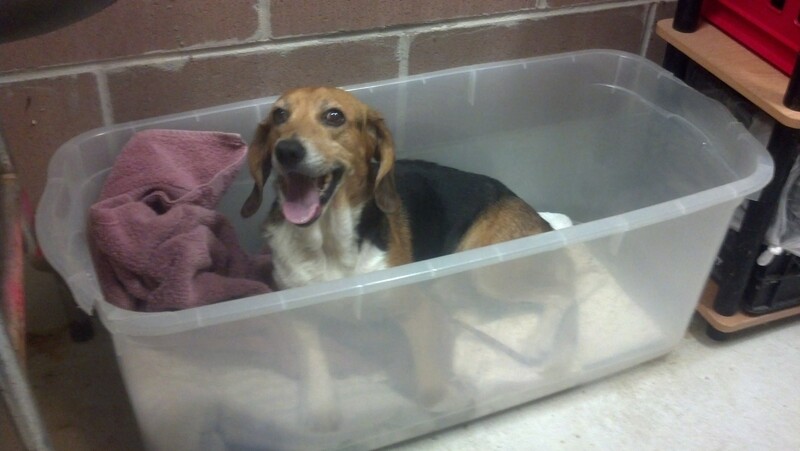 The Beagle would sit in her kennel and howl until someone came over to visit her. It’s tough to network a dog you haven’t met, so as soon as Suzanne got home she went over to the shelter to meet Amanda the Beagle who, as it turned out, is an awesome dog (and Amanda the Volunteer is awesome too!). Amanda the Beagle is quite a character. Besides loving a good belly rub, she also loves nesting in blankets and towels. As soon as we’d put down a blanket for her to sleep on she would roll around on it and make noises of appreciation – it was part crying, part howling, part talking. She’s one of those dogs that just made us smile all the time. 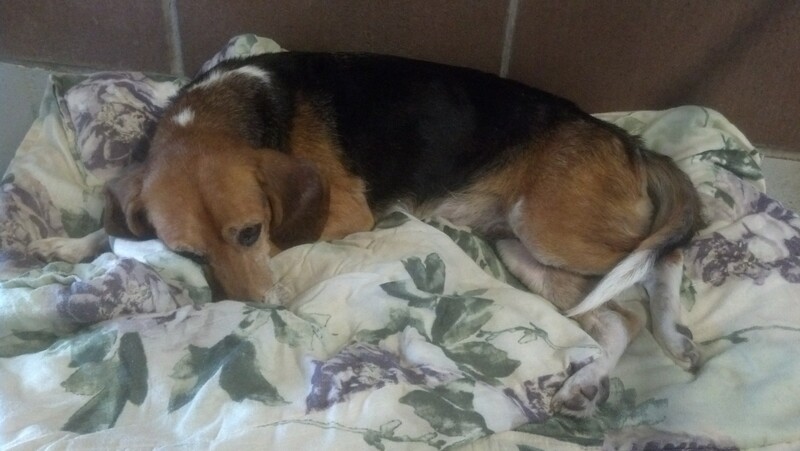 Unfortunately, as we tried to network Amanda we discovered that older Beagles are commonplace in southern shelters. We weren’t having much luck because the supply is greater than the demand. We were getting discouraged and then one day our friend Michelle, founder of Pound Pups in Need, said “Why don’t you try Maranatha Farm? They have a seniors for seniors program.” We had heard of Maranatha Farm but we also knew that they probably received a million emails a day (this was later confirmed, they DO receive a million emails a day…well, maybe not a million, but hundreds) so they weren’t on our initial list of folks to contact. But somehow the stars aligned for Amanda and when we emailed them that night we heard back almost right away and they said they would take her. So the next morning, on our regular Saturday trip to Hilton Head to take our dogs to the beach, we picked Amanda up at the shelter and headed up to Maranatha Farm. Our dogs were very curious about this newcomer and we could tell they were wondering if we were going to keep her. And Amanda was so excited to be out of the shelter that she just couldn’t contain her excitement. She howled and howled and howled for the first 10-15 minutes and then promptly fell fast asleep in Suzanne’s lap for the rest of the ride. We’ll have to write more about Maranatha Farms another day – it is truly a magical place. There were dogs of all shapes and sizes, all ages, even a dog in a wheelchair who happily wheeled himself into the pond to cool off and then went running/rolling after his friends for a game of chase. This is what I imagine heaven looks like for a shelter dog. Amanda quickly settled in and the last thing we saw as we turned to leave was Amanda heading off with a few other Beagles to explore the property. Thank you Maranatha Farm! Amanda has been adopted through Maranatha Farm.